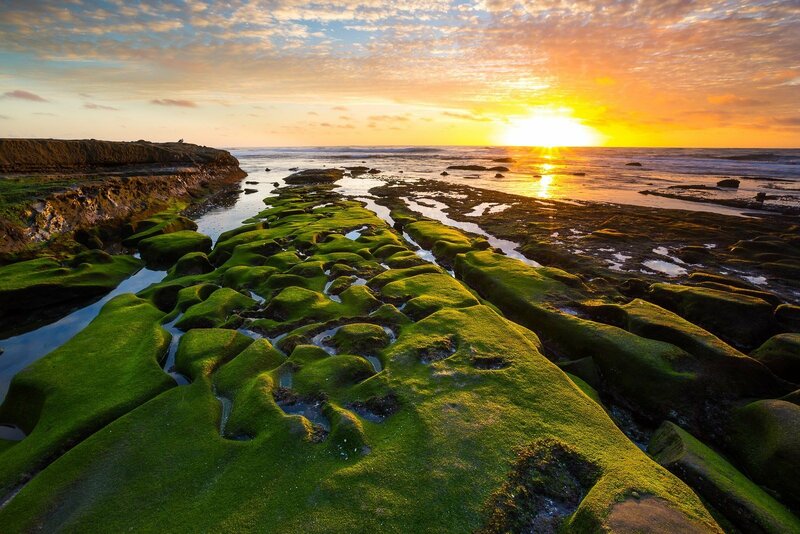 La Jolla tide pools are among the best in town as we have multiple spots to visit up and down our 7-mile coastline. They’re never the same on any given day as tides change and sea life moves from one habitat to the next. 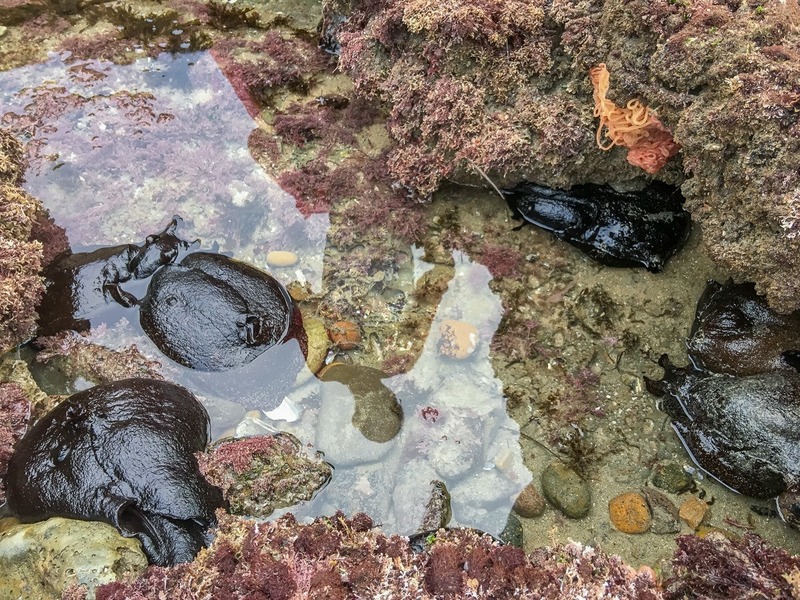 What you’ll find in this post is a mix of tide pooling topics including where to go tide pooling in La Jolla, a preview of sea life typically seen in local tide pools, tips for best tide pooling practices, and other helpful advice you will want to read before heading out yourself. 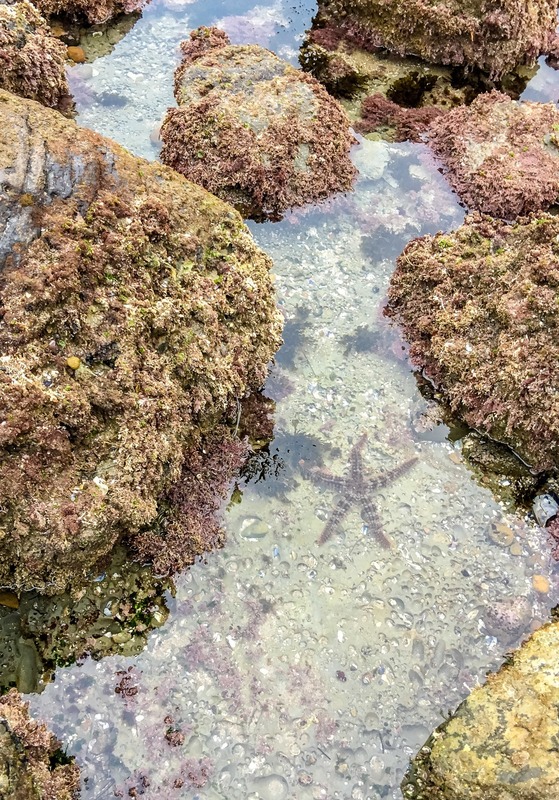 My sources include information gathered from my own tide pooling experiences, an interview with Danny Beckwith who is an Education Specialist at Birch Aquarium, and our recent tide tide pooling adventure with Birch Aquarium. Danny says, “Typically we start seeing good times [for tide pooling] starting in late October, going all the way to March.” The moon’s gravitational pull (the sun has a smaller tidal effect, too) on the Earth as it rotates causes lower tides to fall during daylight throughout the season. 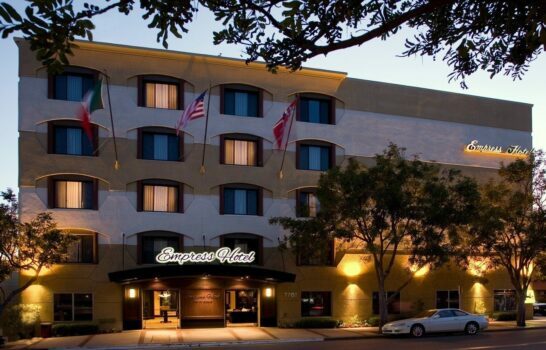 California experiences two high tides and two low tides per day, unlike the Gulf Coast and other parts of the Earth which experiences one low tide and one high tide per day. I check the San Diego tide charts and note when minus tides are happening during times we can go. Most access points to La Jolla beaches will have tide pools if there is a minus tide. 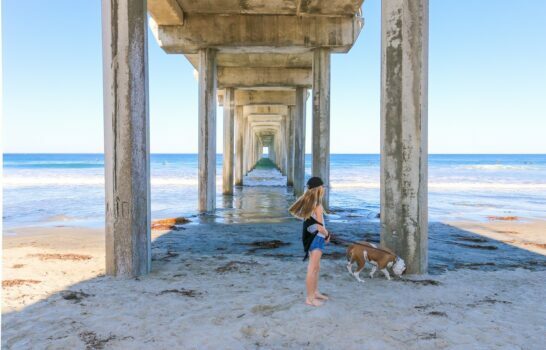 Some access points are tucked away in residential neighborhoods (these are not mentioned on this list, with the exception of one) while others are easily accessible from Coast Blvd in La Jolla or La Jolla Shores beach. 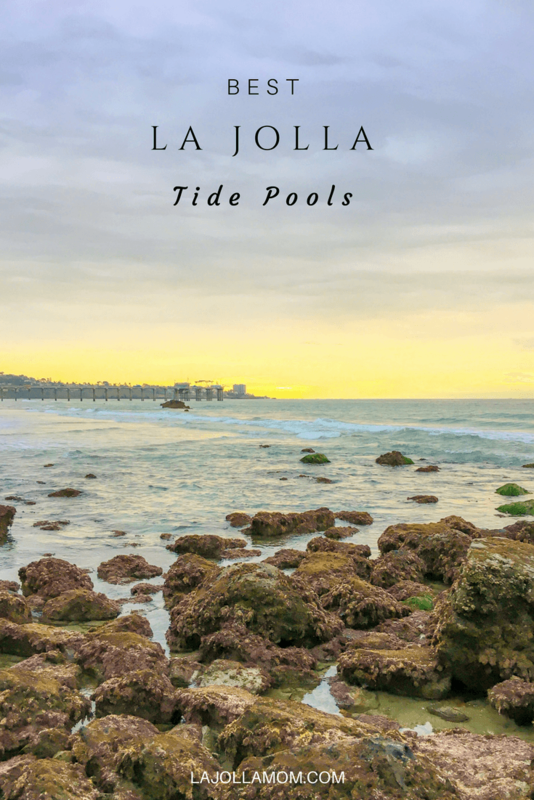 Here are some of the best tide pools in La Jolla. Dike Rock is located just to the north of Scripps Pier. This is where we took a Birch Aquarium tide pooling tour. Danny says, “Dike Rock is interesting because it’s more of a sandy habitat interspersed with big rock formations.” The sand tends to draw juvenile fish, blind gobies and different shrimp. The kids loved climbing over the rocks here as every little pool was home to a different plant or animal. The benefit to tide pooling in a group is that there are more eyeballs to spy different animals—I can’t recommend it enough. And, of course, the Birch Aquarium guides know exactly where to look. At the time we visited, huge sea hares were out in abundance laying eggs. 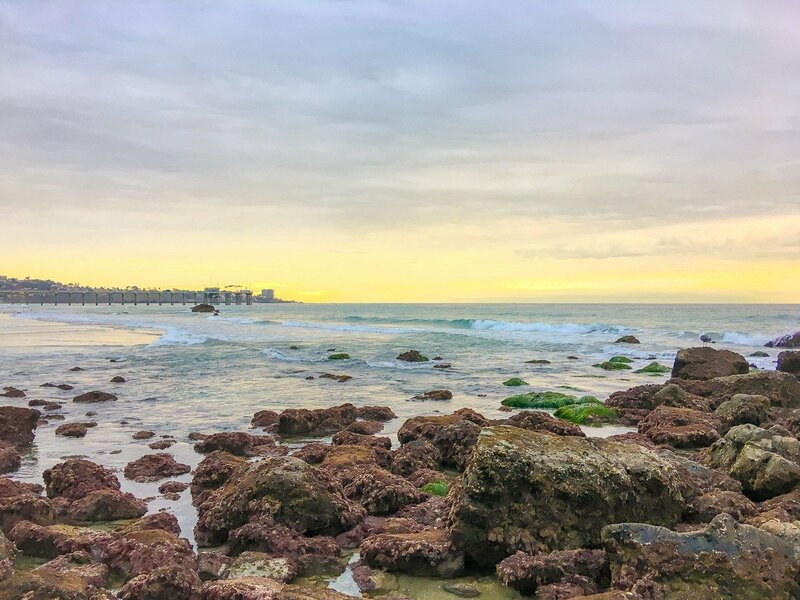 Park at La Jolla Shores beach or near The Marine Room restaurant and use the beach access there for tide pools and gorgeous views. I’ve been told that high numbers baby sea hares have recently been spotted here. If it’s low tide at La Jolla Cove, many of the sea lions and seals will head out to little rock islands in the ocean. This means you’ll be able to walk the big flat rocky area between Boomer’s Beach and La Jolla Cove with ease. On these rocks, which are accessible from the boardwalk, you might see a variety of crabs and a few sea anemones but not too much else. During low tide, the seals won’t likely be here but this is another little tide pooling spot to look for. 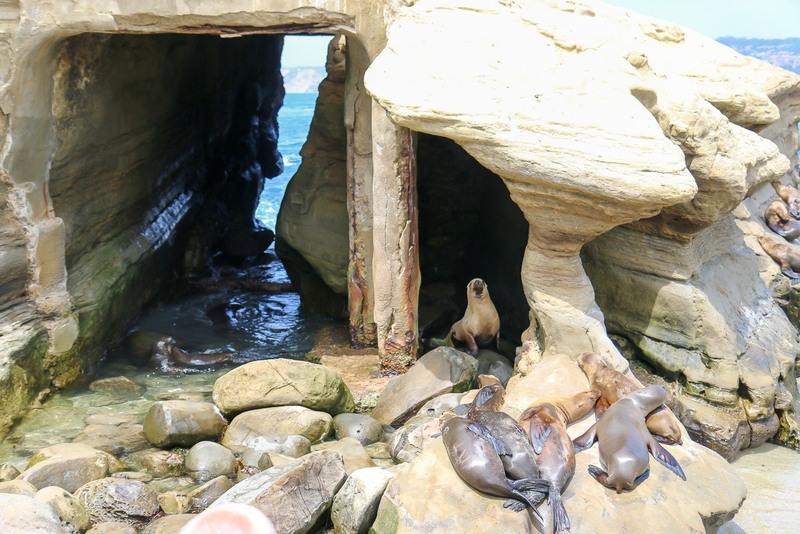 Your best bet is to take the stairs down to the sand to explore the little cave and rocky area accessible from the La Jolla Cove beach. The other good news is that you can start at La Jolla Cove and walk south down the boardwalk to most of the tide pooling spots listed below. The stairs to Shell Beach are currently blocked at the base by big rocks washed up by the ocean. You’ll need to tread carefully over them. However, this is a great little place for tide pooling. Last time, we saw lots of crabs, limpets and a few sea anemones. Heading south from Shell Beach, South Casa Beach behind the Children’s Pool sea wall (Children’s Pool is where the harbor seals hang out) is another tide pooling gem with easy access via a stairway. These tends to be an easy spot for kids to explore as there is sand to walk on in addition to rocks. Walk a few minutes further south from South Casa Beach to Wipeout Beach. From here to Hospitals is one of our favorite tide pooling spots. If you’re a photography buff, Hospitals is where these little round and curved pools reveal themselves (they are incredibly popular on Instagram and Pinterest) during low tides. Here, you’ll find mostly rocky bluffs with little pockets of sand. We’ve spotted crabs, limpets, sea anemones, fish, sea slugs, urchins and more time. Stay for the sunset. The waves surfers rave about here are due to underwater reefs. Some reveal themselves during low tide. It tends to be a little less crowded here though mostly a sandstone landscape (that you’ll have to scramble down) versus actual sand. Sea anemones and various crabs are most commonly seen here, it seems. False Point is a good option for those who live in or are staying in the Bird Rock neighborhood. Its draw is that there are lots of rocks to navigate, many of which are loose. The good news is that flipping them over (remembering to put them back) can reveal a myriad of creatures. Take the stairs down to the beach from Sea Ridge Drive. This is also where Birch Aquarium leads tours. It’s incredible to think that an animal must be able to tolerate currents, sun and sometimes hours in air to survive life in a tide pool. This is by no means a complete list of animals, but these are the most common. Did you know that sea anemones can live 50 years or longer and that there are over 1000 varieties that are found at different depths worldwide? 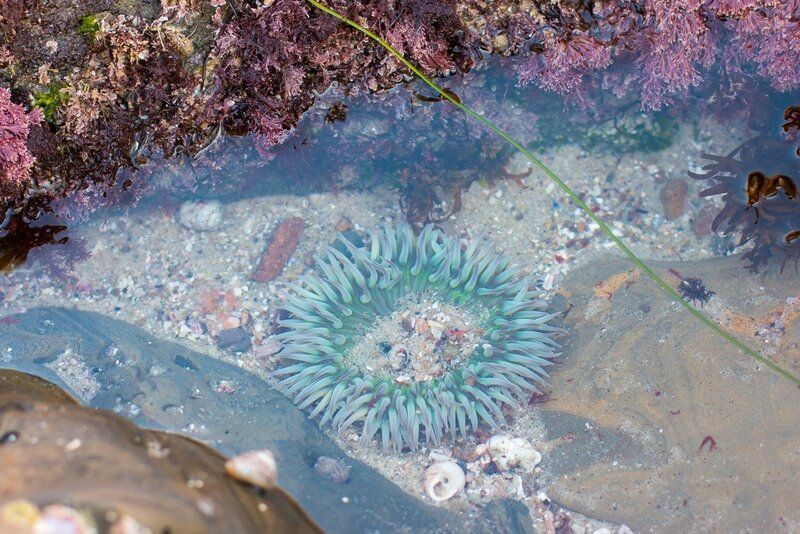 Sea anemones are my favorite tide pool creature. We have mostly two types here in San Diego. The first is the solitary sea anemone which I’ve always been particularly fond of. Their tentacles range from a pale green to a blueish-green color. To survive in air or when disturbed, they curl their tentacles inward to reveal a soft brown exterior that is often dotted with broken shells. When submerged in water, their tentacles are typically open. The other type of sea anemone most commonly seen are smaller, less colorful (or brown really) and live in groups. Sea anemones can also slowly change location. 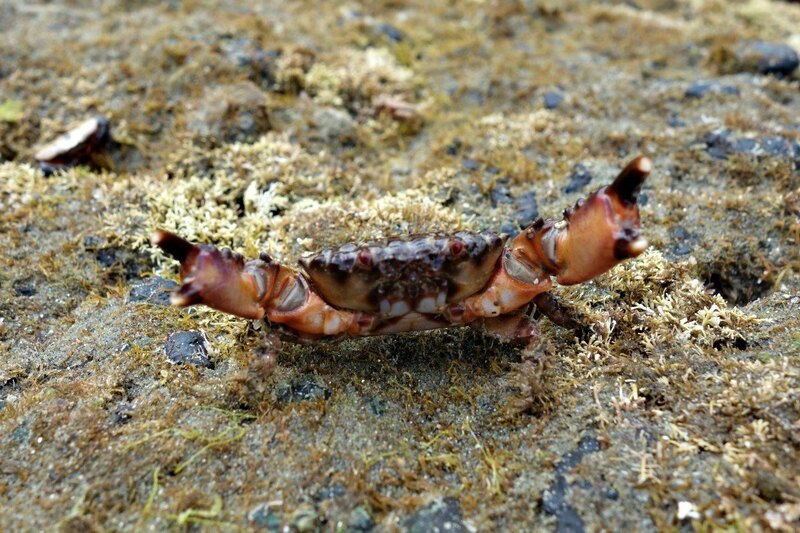 Our little tide pool crabs are small and fast, scurrying sideways over over tide pools with their little pinchers. Fun to watch, they’re able to hide in little crevices and pretty much eat whatever they can grab. They can split time above and below the water. While they don’t move around as you’re watching, I personally love finding chiton and limpets stuck to rocks. They’re quite common in all of our tide pools. Always a source of entertainment hermit crabs can be found in abundance. I’ve seen them scurrying around in various sizes and underneath a variety of shells every single time I’ve been tide pooling in La Jolla. While I have yet to see an octopus in a San Diego tide pool, Danny vividly remembers his first sighting. “I got really lucky when I pulled up this turban snail shell,” he says. 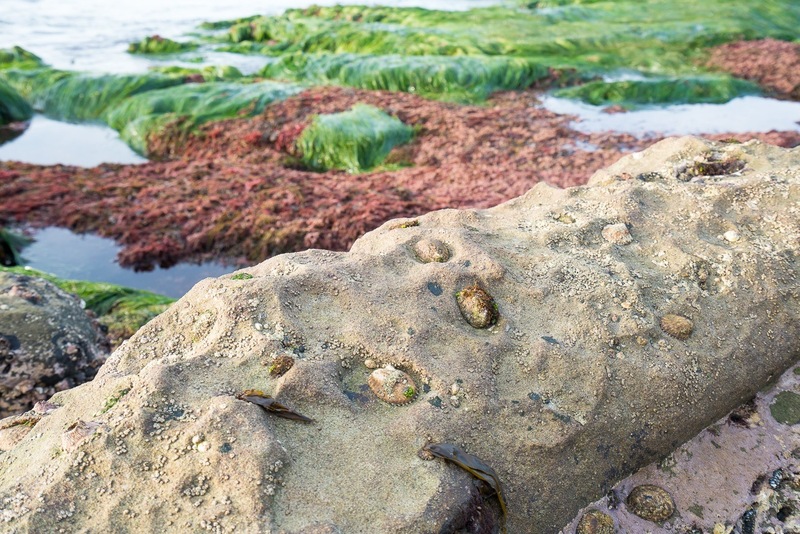 Turban snail shells are commonly found around La Jolla tide pools and about the size of your fist. He saw a little arm and tentacles scrunched up inside and realized it was an octopus using the shell as a hiding spot. They put it in one of their bins and out came a 2-foot long octopus. “It just blows your mind because this animal is just scrunched up in there like a cool neat little hiding place,” Danny says. Octopuses have no bones so can fit into any space that is the size of their beak, a neat adaptation for living in tide pools. Danny shares that environmental changes are impacting the amount of sea stars seen in local tide pools. We were lucky to see two during our Birch Aquarium tide pooling tour at Dike Rock. A brittle star found during a Birch Aquarium tide pooling tour in La Jolla. 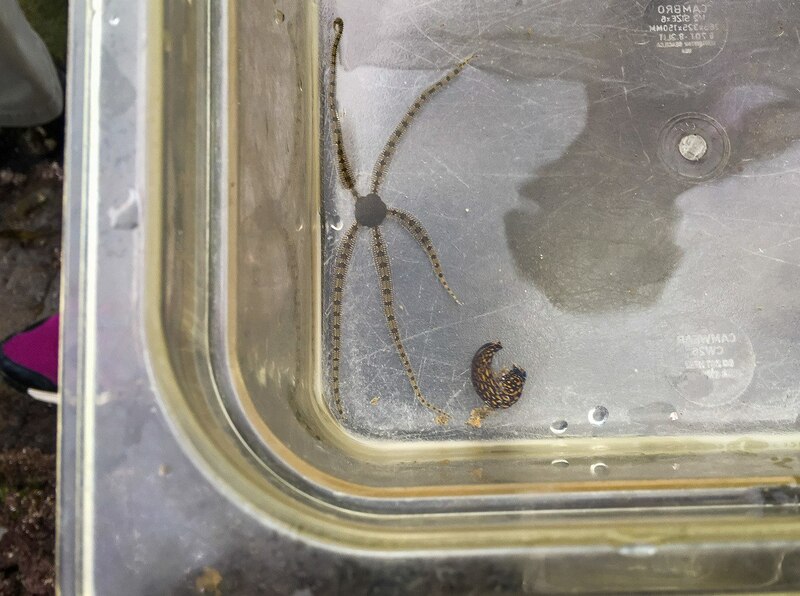 One of our Birch Aquarium guides spotted a brittle star and scooped it up with water into a bin for us to see (in addition to this little sea slug). The kids loved watching our guides and volunteers try to identify what kind of starfish the one pictured below was. It was neat to see the starfish move around this pool! 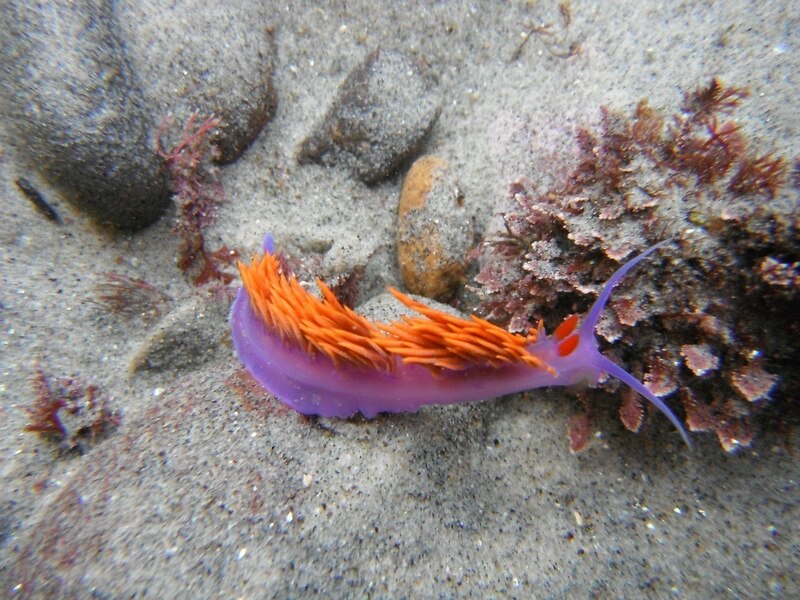 Tide poolers in La Jolla can usually spot two types of sea slugs. This first is a Spanish Shawl. It’s only 2-3 inches long but it’s neon purple and orange gills are quite striking against the tide pool landscape. Sea hares and their eggs (the orange string) as seen at Dike Rock tide pools in La Jolla. On the other side of the sea slug spectrum, sea hares grow to about a foot long. Sensors that look like rabbit ears on their head sense chemicals in the water. “Depending on what the sea hare color is, we can tell what the animal has been eating,” Danny says. If they’re eating red algae they turn red. If they’re eating dark green algae they turn black or green. Sea hares will also emit a dark purple ink if stressed. If there are tide pools, there will most likely be a variety of barnacles. 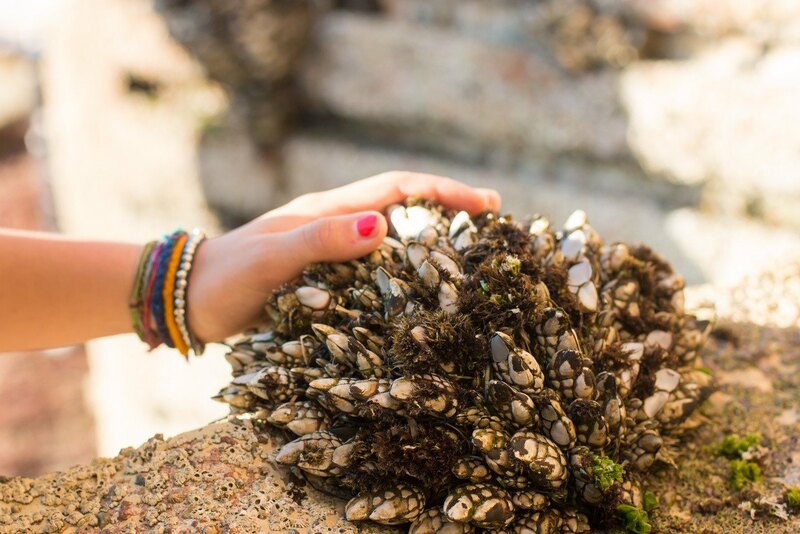 You’ll see the regular variety that grows in clusters on rocks and piers in addition to larger gooseneck barnacles. Most of La Jolla’s coastline is in a Marine Protected Area. This means that you may not remove any marine objects, whether living or dead, from these areas. Watch out for algae-covered rocks. If it’s green, brown or black, avoid stepping on it or tread lightly. Whatever you bring in, take back out. If you move anything like a rock, put it back. An animal might us using it for an habitat. Never turn your back on the ocean. It’s easy to get excited and not see a wave coming. If you’re going to touch something, exercise caution. Be aware of what might be on your hands like hand sanitizers or other chemicals that may be harmful to animals. If you’re unsure of what something is, the best practice is not to touch it. Always rinse your hands off first and only touch for only a few seconds. This graphic is fantastic to discuss with kids and whomever you’re going tide pooling with. 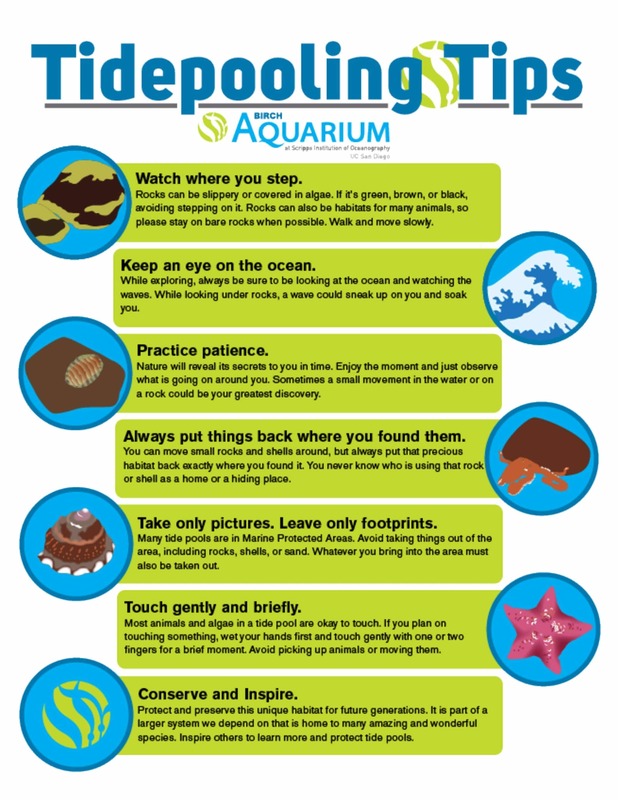 Save it to Pinterest or print out a PDF here: Birch Aquarium Tide Pooling Tips. Good tide pool etiquette can also be practiced at home. Danny points out that the tide pools are first interface between land and water so any sort of runoff will hit them first. This means anything entering our storm drains—litter, chemical fertilizers, oil, grease and more—can impact our tide pools. Did you know that one of many jobs our tide pools perform to protect us includes slowing down water before it erodes our cliff sides? They’re important. Let’s protect them. The following advice is what I have found handy while tide pooling with kids in tow. Footwear is incredibly important. 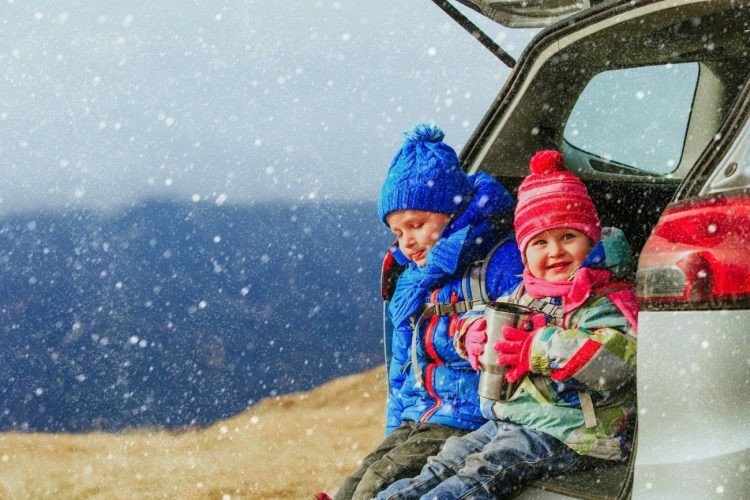 Shoes or boots with a good grip that can get wet are ideal. Flip flops are not advised. It is also wise to keep a change of shoes in the car if you’re headed elsewhere after a tide pooling adventure as your shoes will get sandy, wet and dirty. If not on a tour, we like the California Seashore Life Pocket Guide, that identifies local birds, crab, fish and other sea life you might see in or near a tide pool (sea slugs are oddly missing from it). If in an area where there is sea grass, it is helpful to bring a light stick to gently brush it away as it floats over water. However, skip the stick if you or the kids can’t resist the temptation to poke animals or in hidden areas where there might be an animal. Be sure to check out Birch Aquarium’s tide pooling tours and other outdoor adventures. Love tide pooling? 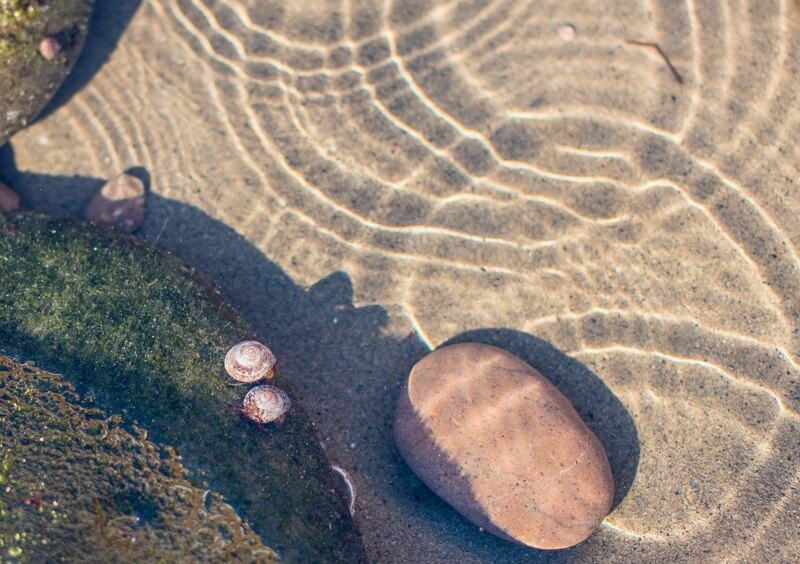 Check out the best tide pools in San Diego! Which La Jolla tide pools are your favorites? What have you seen? 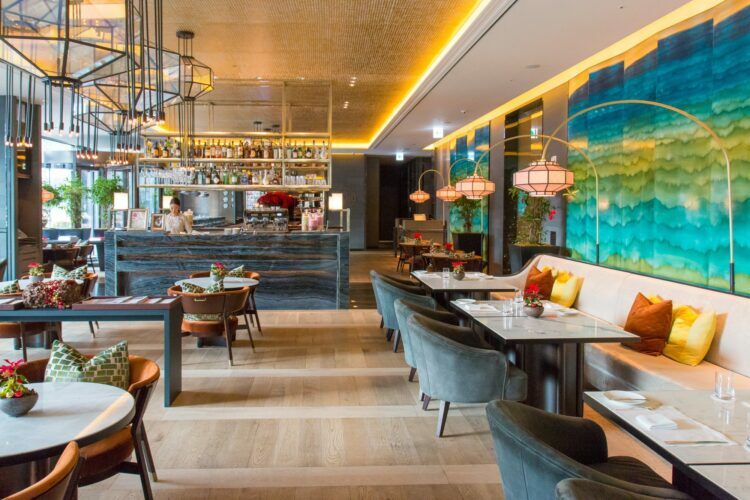 Lovely photos and an excellent write-up, but there’s a necessary caution that’s missing. “False Point,” which the locals know as “PB Point,” is an absurdly dangerous place to take children (and even adults). I’ve never understood why Birch Aquarium promotes it to visitors. Unlike many tidepool sites that have sandy bottoms, PB Pt. is composed of rocks of various sizes, from large pebbles to small boulders, and they shift position constantly. Even if you proceed with extreme caution, a rock can twist under your weight. To make matters worse, there is old construction debris among the rocks, including rusted rebar that can impale the unwary. 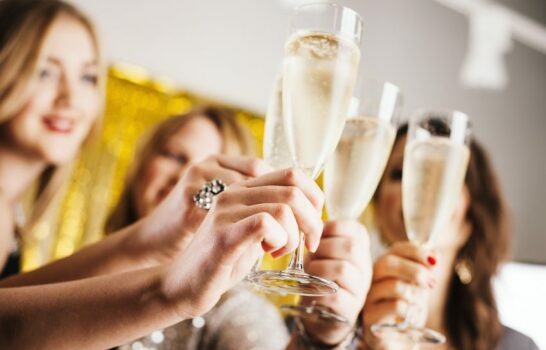 I’ve had many friends who’ve gone down there, and all of them have returned with stories of falls, including one who wound up in the emergency room. When I went down, I took a fall so bad I cut my scalp, and nearly had a concussion. Would I take a child down there? Uh….no! You are absolutely right about the twisting rocks. I think it is definitely something everyone should be aware of. Thanks for bringing it up.